4" x 3 1/8" Clear vinyl pocket with an 0.060 x 1" x 3 1/2" adhesive magnetic strip with indoor/outdoor acrylic adhesive applied to the back. Use to store or protect practically anything you can imagine. Made from heavy 8-gauge clear material on the front and back. Use the magnetic strip to attach the pouch to practically any magnetic-receptive metal surface. Why are our prices lower than what you see elsewhere? Because we are the manufacturer of this product so you get more for your money. 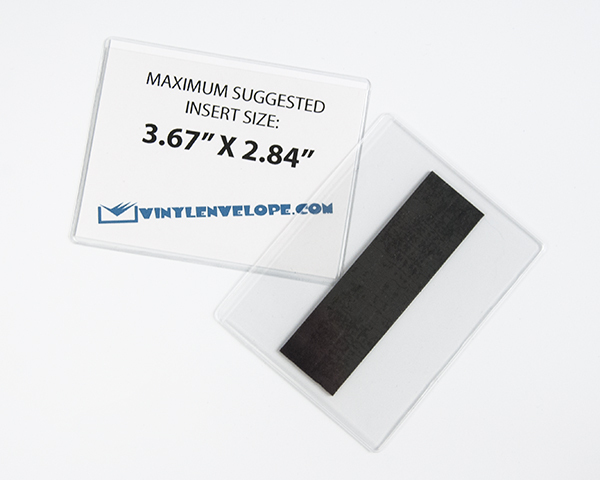 Overall dimensions: 4" x 3 1/8"
Pocket dimensions: 4" x 3"
Store, display or protect your documents or other items. Organize your warehouse, store or closet. There are endless uses for clear magnetic vinyl pouches. Other sizes are available.